KTM 390 Duke, which is one of the most popular entry-level performance bikes in India. There are quite a few transformations and modification jobs based on the KTM 390 Duke in India. 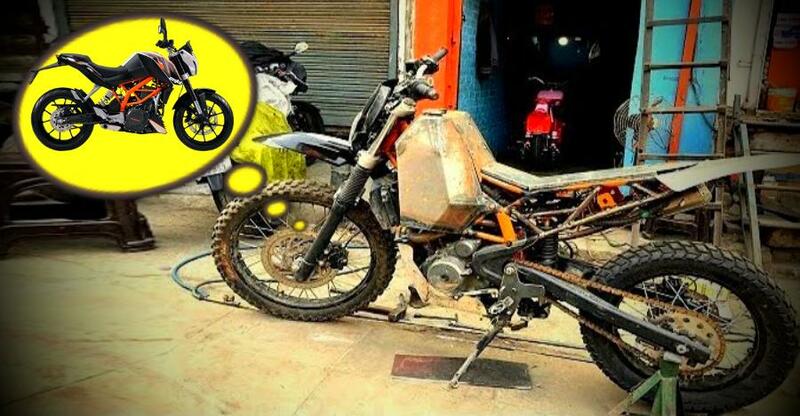 Here is one such similar, highly practical dirt bike conversion of the KTM 390 Duke. The video by MACK RIDER also shows the work in progress on the bike and the final product too. The donor bike is a previous generation KTM 390 Duke but in the final form, it is difficult to make out the base bike in the video. Most of the parts of the bike have are custom made to fit the motorcycle properly. The parts and body panels of the old Duke have been removed completely to fit in the new parts. Even the chassis has been altered to make the dirt bike stronger and add a few visual aids too. As mentioned above, most of the parts of the bike are handmade including the tank. The stock tank bears no resemblance to the new tank, which is mounted vertically on the frame and it is much shorter in size, which allows the riders to stand and ride the bike, which is an essential need during the dirt biking. It also gets modified swingarm and a new set of front suspension. An extra layer of protection to the engine has been added too. Custom made guards have been placed in front of the engine to save it from any kind of hits from stones while doing high-speed off-road runs. The stock alloy wheels have also been replaced with new spoked rims that are much more durable and sturdier than the regular alloy wheels when it comes to off-roading. A new custom exhaust has been added to the bike too but it is not known if it provides any performance gains on the 390 Duke. It is also not known if any engine modifications have been done to the bike. In the stock form, the KTM 390 Duke produces a maximum power of 43 Bhp and 37 Nm. It gets a liquid-cooling system that has been retained in the dirt bike and the system has been secured against any kind of stone hits with a mesh grille in the front. The seat of the dirt bike has been modified and it gets a new, much narrower seat. Even the handlebar and the headlamp has been replaced with a new one with a visor. Other minor changes have been done and a lot of accessories have been added to the bike including extra LED lamps for better visibility at night. The bike has been painted in black but it looks like the base coat only and the upper layer of the bike will get a new coating. In all, it sure looks like a purposeful modification and if you want something like this for your bike, you can contact Mack Rider directly for more information.